Home »Divine Mercy »St. Faustina & Diary »The "New Congregation"
The charism of Saint Faustina yielded not only the new school of spirituality but also the Apostolic Movement of the Divine Mercy. It undertakes in different manners her task of proclaiming to the world the message of Mercy through the testimony of life, deeds, words and prayer. I can see clearly that there is going to be not only both a female and male congregation, but a great association of lay people which everybody can be a member of and thereby with his deeds remind others about God’s mercy and exercise mercy towards others. Please do not think that these thoughts are [mere] madness, for they are the sincere truth, which will shortly be carried out in deed, even if I would have no one in favor of this work; still, I am not discouraged by anything, for it is enough for me to know that this is the will of God. where souls separated from the world will burn as an offering before God’s throne and beg for mercy for the whole world …and by their entreaties, they will obtain blessings for priests, and through their prayers prepare the world for the final coming of Jesus (Diary 1155). and in this egoistic world they will try to rouse up love, the mercy of Jesus (Diary 1156). ought to perform at least one act of mercy a day, but there can be many more, for such deeds can easily be carried out by anyone (Diary 1158). The Apostolic Movement of the Divine Mercy began to develop still during the life of St. Faustina, along with the popularization of the devotion to the Divine Mercy in the forms passed on to us by her. In 1937 Fr. Michał Sopoćko published in Kraków images of the Merciful Jesus with the chaplet of Divine Mercy and a little booklet with prayers, entitled Chrystus, Król Miłosierdzia [Christ, King of Mercy]. The Sisters from the Congregation of Our Lady of Mercy who received them, and everyone who got them and said these prayers, realized themselves the task of imploring the Divine Mercy for the world, creating in that way the first multitudes of people in the Apostolic Movement of the Divine Mercy. A dynamic development of the devotion to the Divine Mercy as well as of the Apostolic Movement of the Divine Mercy occurred during the years of World War II and the post-war years. In these difficult times people were looking for hope, light and power in the Divine Mercy, thus images of the Merciful Jesus, the Chaplet and novena dictated to Sister Faustina were very popular. The multitudes of worshippers of the Divine Mercy grew, new communities, apostolates and centers undertaking the task of propagating of the worship of the Divine Mercy came into being. The spontaneously developing Apostolic Movement of the Divine Mercy was slowed down by the Holy See’s Notification of 1959 which placed a ban on propagating the devotion to Divine Mercy in the forms handed down by Sister Faustina. Then the Congregation of the Sisters of Our Lady of Mercy, and also the Marian Fathers in the USA and other centers, adapting the directives of the Notification, stopped to spread the life and Sr. Faustina’s mission, and among them the forms passed on by her. The 19-year long period of Notification – which Sister Faustina herself had predicted – turned out to be a blessed time during which the diocesan process about the life and virtues of Sr. Faustina was carried out, and Rev. Prof. Ignacy Różycki, performed an in-depth theological analysis of Sister Faustina’s writings and thereby laid solid foundations for the devotion to Divine Mercy in the forms passed on by her. The Congregation of Pallotine Fathers organized theological symposia devoted to the mystery of the Divine Mercy and the mission of Sr. Faustina, which resulted in the publications of books. The next stage in the development of the Apostolic Movement of the Divine Mercy started with the withdrawal of the Notification of the Holy See in April 1978 and has lasted until today, involving old and new religious congregations, different brotherhoods, apostolates, communities, and individual people who undertake the task of proclaiming the mercy of God through the acts of mercy, words and prayer. A great influence for the development of this movement turned out to be the beatification and canonization of Sister Faustina and also the teaching of the Holy Father John Paul II (e.g. 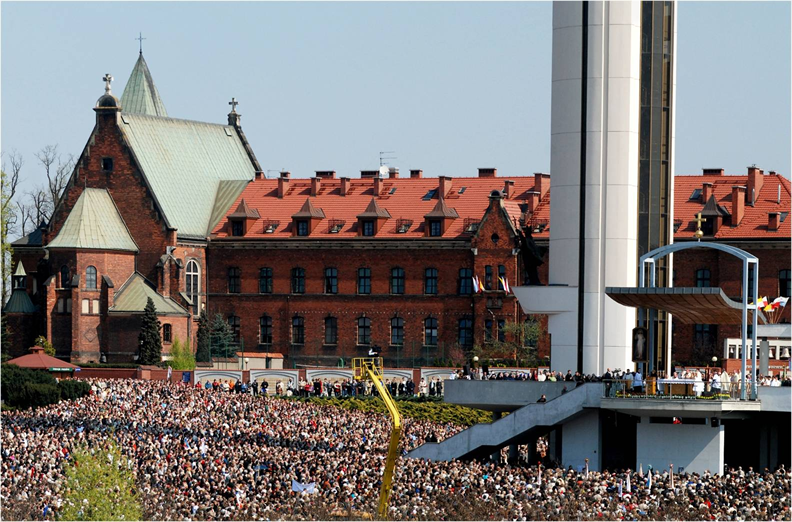 the encyclical “Dives in Misericordia”) and his visits at the Shrine of the Divine Mercy in Kraków, Łagiewniki. Today the Apostolic Movement of the Divine Mercy embraces millions of people around the world, who in different ways continue the mission of Sister Faustina.